A woman’s pelvis and reproductive area can be subjected to a number of traumas through- out life. Surgery, endometriosis, infection, and abuse are primary causes of adhesion formation. Falls onto the back, hip, and tailbone can cause tiny adhesions to form in the muscles and organs of the pelvis, gluing delicate structures, and decreasing fertility. 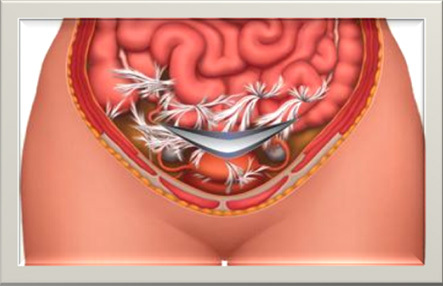 Pelvic pain is often cause by adhesions. When tissues become injured, infected, or inflamed, tiny but powerful collagen cross-links form as the first step in the healing process. Like the tiny strands of a nylon rope, these fibres are the building-blocks of adhesions which form in injured areas. Adhesions or scarring can bind together organs, nerves, muscles, and neighbouring structures in strong glue-like fibres that create tiny but powerful bonds. These bonds may be shaped like ropes or woven patterns. Left: a representation of a normal peritoneum, the transparent membrane that wraps the pelvic and abdominal organs. Right: after surgical trauma, fibrous bands of collagen grow as part of the normal healing process and form adhesions. 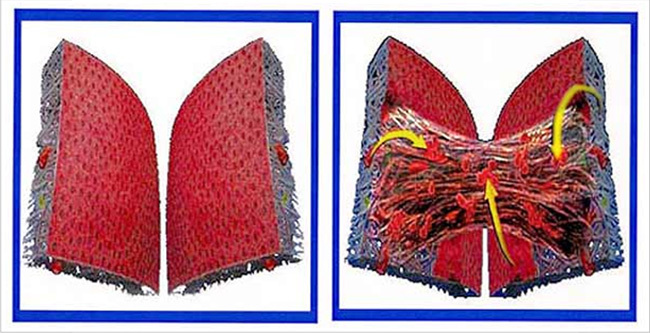 Adhesions connect tissues or structures that are normally separate. Adhesions in the abdomen or pelvic area can lead to infertility, pelvic pain, small bowel obstruction, or the need for repeat surgery. Adhesions can form after any major surgery.